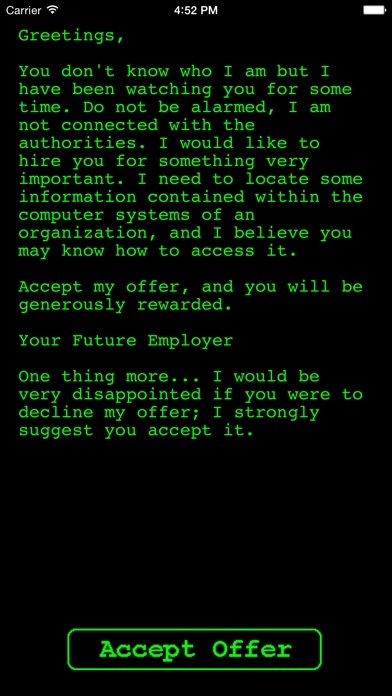 Ever wanted to be a hacker? Play Hack RUN! Hack your way into the heart of a mysterious organization to uncover their secrets. 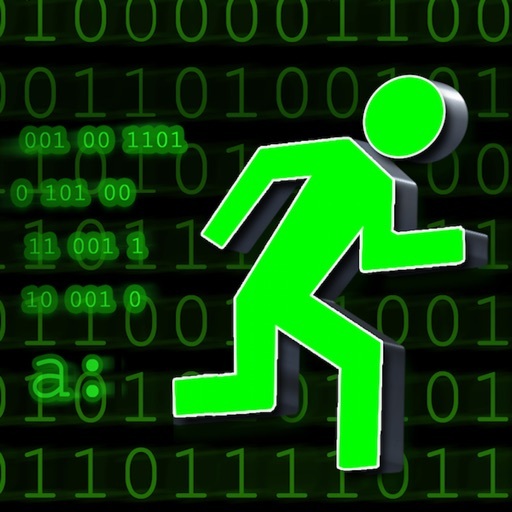 Hack RUN® is a game which uses 'old school' command prompts (like DOS or UNIX) that simulate a real operating system. Learn the commands of each system to help you navigate through your adventure. As you hack into their systems, you will learn about the organization and the people who work there. Read files and emails to find clues and riddles which will give you access to more accounts. Data found on their systems will help you learn about the motives of the organization, and how dark their plans can get. You may also discover dirty little secrets about the employees as well. Hacking into new accounts or discovering key information will increase your skill level. As you achieve your goals, you will move closer and closer to the final achievement; over 60 levels deep! It's time for a Hack RUN! Use the Apple TV companion app to enhance your game on the big screen! Apple Watch support! Now you can display the recent contents of the terminal on your watch, view your achievements and view tips and help. GAME CENTER SUPPORT: Earn achievements and compare your leaderboard score against other players. Stuck on a level? Just use the 'hint' or 'answer' commands to help you along. Make sure to play all FIVE games in this series! Play 'Hack RUN 2 - Hack ZERO', 'Hack Time', 'Hack NET' and 'Hack WATCH' after you complete this game! Great news! Hack RUN® has been featured in the App Store! We are thrilled Apple has given us this honor, and we hope you enjoy it as much as they do! "Great fun! - I just finished Hack RUN, what a great game! I'm a big fan of interactive fiction and this is a wonderful example of how the genre can be expanded and still be current." "BRILLIANT - This game is innovative, clever and a HUGE breath of fresh air..." "This is AWESOME!!! 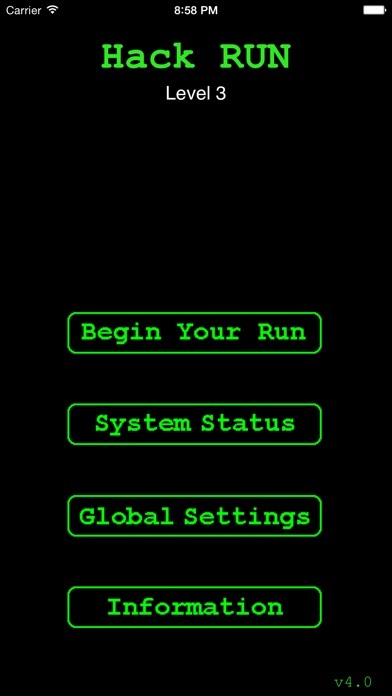 - This game us so cool that I stopped texting my girlfriend to play it haha :P" Hack RUN® is a game. It is not a tool or aid for learning how to hack into real computer systems. i273, LLC does not endorse hacking. > OUR BIGGEST UPDATE EVER! > We added The Lost Levels to the game! That's 20% more hacking - exclusively on the iPhone and iPad only! > Exclusive multimedia content only available on the iPhone and iPad! > Various game improvements to enhance your hacking experience.